Director – William Beaudine, Screenplay – Carl Hittleman, Producer – Carroll Case, Photography – Lothorp Worth, Music – Raoul Kraushaar, Photographic Effects – Cinema Research Corp, Makeup – Ted Coodley, Art Direction – Paul Sylos. Production Company – Circle Productions Inc. While travelling through the American West by stagecoach, Count Dracula meets landowner James Underhill and becomes captivated by a picture of Underhill’s niece Betty Bentley. After Dracula drinks the blood of an Indian girl, Indians attack the coach, killing all. Dracula then poses as Underhill and takes over his Double Bar B ranch. As Dracula moves in on Betty to drink her blood, two European immigrants realise that Dracula is a vampire. It is up to the reformed Billy the Kid, who is working as Double Bar B’s foreman and in love with Betty, to stop Dracula. Billy the Kid Versus Dracula, along with its shot back-to-back companion piece Jesse James Meets Frankenstein’s Daughter (1966), is preceded by a reputation that places it up alongside the likes of all-time worsts such as Plan 9 from Outer Space (1959) and Robot Monster (1953). However, seen for the first time Billy the Kid Versus Dracula disappoints somewhat on its reputation – ironically by not being bad enough. The film is not a particularly good one, but then neither is it a resoundingly bad one, it neither having the truly parsimonious cheapness nor the dialogue howlers that makes so many of these films alternately so horrendous and so perversely entertaining. It is certainly extremely cheaply made – there is a very poor bat on a wire effect, while every time John Carradine changes from a bat to a person the bat conveniently flies off camera and then Carradine steps out – but then if cheapness were the only measure of truly bad films it is one most vampire movies would be guilty of. On the plus side, the colour photography is much better than one would expect. One suspects that the film’s reputation is something that has been derived from only a cursory glance at its title more than anything else. At most, Billy the Kid Versus Dracula is down at the level of a Western B-programmer. The plot is dull, sedate and unsurprising. One supposes it may even have a subtext. 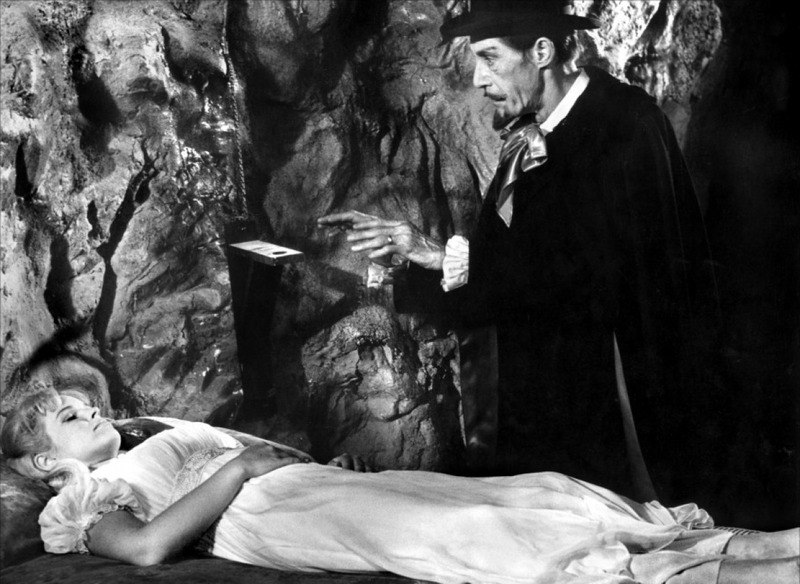 In this case, the vampire, traditionally a sexual predator, is seen to be undermining the traditional values that the Western codifies – invading the heroine’s ranch home from within in order to seduce her and there being an unmistakable link wherein Dracula’s advances on the heroine are seen as disempowering the hero who has to regain his masculinity (which is equated with possession of the heroine) by staking the vampire. On the whole, Billy the Kid Versus Dracula is not much of a horror film – Dracula is of little consequence to the plot – he could have been a conman attempting to steal the land and seduce Melinda Plowman with only the smallest amount of rewriting. The plot is not even particularly interested in Dracula as a vampire either – he is allowed to walk about in daylight and no blood is ever shown. For that matter, the story is not interested either in the real Billy the Kid, who was shot in 1881 by Sheriff Pat Garrett while still an outlaw and only 22 years old. The earnestness of Chuck Courtney’s handwringingly “yes ma’am” polite performance as Billy entirely fails to convince one that this is the same person that was also a ruthless outlaw. John Carradine, who was also Dracula in some of the 1940s Universal monster bashes, plays hammily, although does fittingly look the part with his cadaverous frame creeping about in a black suit and stovepipe hat, outfitted with a black goatee and his hair slicked back with a Satanic look. He seems to do all his acting by bulging out his gaunt eyes – whenever he is set upon drinking a victim, the camera closes in on his face, which is then illuminated with a hellish red glow. Director William Beaudine had a prolific career that lasted from the 1910s until his death in 1970s. He was mostly known as a director who could shoot fastly and cheaply. He made some 350+ films, although this figure is misleading as many of these were silent films and not feature length. Beaudine did make a number of other genre films, including the Old Dark House film The Living Ghost (1942), the comedy Lucky Ghost (1942), the mad scientist film The Ape Man (1943), the East Side Kids Old Dark House comedy Ghosts on the Loose (1943), the mad scientist film Voodoo Man (1944), the mad scientist film The Face of Marble (1946), the East Side Kids/Bowery Boys Old Dark House comedy Spook Busters (1946), the Bowery Boys film Ghost Chasers (1951), the mad scientist comedy Bela Lugosi Meets a Brooklyn Gorilla (1952), the Bowery Boys film Jalopy (1953), the Bowery Boys film Paris Playboys (1954), the Bowery Boys film Up in Smoke (1957) and The Green Hornet (1974), a compilation of episodes of the superhero tv series.